F. Spalding, Duncan Grant, London, 1997, pp. 410-11. London, Spink, Duncan Grant and Vanessa Bell, Design and Decoration 1910-1960, October - November 1991, no. 95 (Winter) and no. 96 (Summer). In 1950 the architect Paul Hyslop commissioned Vanessa Bell and Duncan Grant to paint decorations on ceramic tiles for the interior of the Garden Hostel annexe, a building Hyslop designed for King's College, Cambridge. The tiled panels were set into the walls of the entrance, stairwell and corridors (and are still in situ) ready for the opening of the building in 1951. 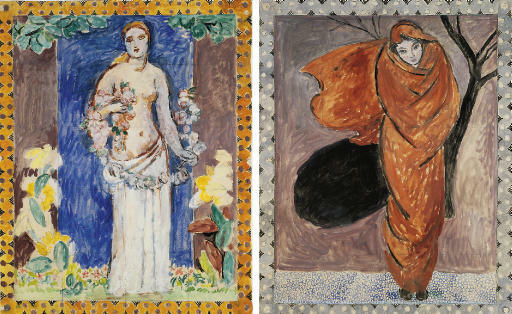 Bell's first designs were female figures representing the Four Seasons (of which the designs for Summer and Winter are offered here). These were rejected by the College on the grounds that undergraduates would find them an irresistible target for graffiti. They were substituted by a series of six smaller decorative still lifes - flowers in a vase in front of parted curtains. Both series share a simplicity of design and boldness of colour akin to some of Bell's earliest decorative projects for the Omega Workshops in 1913-14. Duncan Grant's large panel of a classical youth reading a book by a fountain is in the entrance hall. We are very grateful to Richard Shone for providing the catalogue entry for this lot.